I may be off the wall, but our shoes aren’t! I was going to post this on Wednesday, but it was our wedding anniversary and so Mr. December and I chose to spend our evening together. On Thursday it stormed and we lost power for eight hours… so no blogging. Here we are, after shabbat… I’ve been dying to share this with you! Our home has a very small entryway. It’s so small that in order to get everyone out the door in the morning, we need to put on shoes and coats 2 at a time. You can well imagine that as soon as there’s anything on the floor, it become impossible (actually, impassible.) Sadly, the kids’ shoes are constantly on the floor. We’ve tried having shelves for the kids’ shoes. We’ve tried asking them to line them up neatly next to the wall. 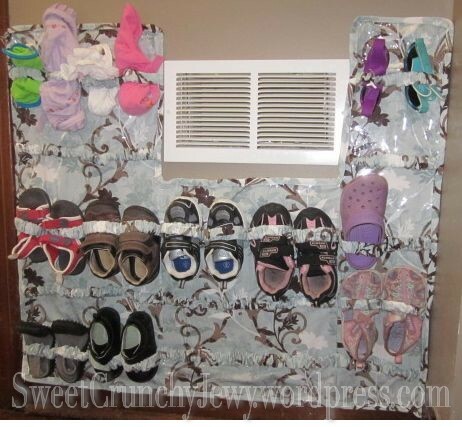 Most recently, the shoes have been kept in an IKEA Trofast bin in the hallway bench – easy to put the shoes away, but finding a pair generally involves dumping all the shoes out onto the floor. I decided to sew a pocket shoe organizer that can be hung on the wall, with smaller pockets to hold more (and smaller) shoes. I bought all the supplies. Then I procrastinated. And then I thought. So I came up with something new, that addresses all of those problems. I ask you, readers: is this solution patentable? ‘Cause if it is, I’m totally applying for a patent. It’s got elasticized straps (kind of like a scrunchie,) one for each shoe, and a vinyl layer on the backing so that dirt from the shoes can just wipe off. I’ve firmly attached it at all possible stress points so that it doesn’t come away from the wall (actually, from the wooden backing that is affixed to the wall) even if the kids grab the straps and lean backwards. The straps are stretchy enough to fit even our bulkiest running shoes, but tight enough to hold baby sunglasses and rolled-up hats. I’m already looking forward to winter, when all of the kids’ hats, scarves, and mittens will be visible and ready to go. The best part? The floor in our entryway has been clear ever since I put this thing up! Oh, and leaving the house takes way less time, since we don’t have to stop and hunt through a bin for the shoes we want. That’s a major plus. So, what do you think? Patent-able or just patently obvious? terrific! I love it! You are genius!!! can’t hurt to try and patent it I’d say! Yup! Such a great idea! And I’ve never seen it done before. You have to patent it. And then make a feature-length infomercial for late-night television. They still have those things, don’t they? You could make a fortune! I do love the way you think. Awesome! You could totally patent it! BRILLIANT!! If you don’t patent it, you should at least send it to Parent Hacks to share. Sara! My brother is a patent expert. He lives in Japan and has many patents to his name. Let me know if you want his contact info. I love love love this idea. Would work well behind closet doors too, which is often useless wasted space. I put my meds in the linen closet near the top away from humid washroom and too high for them to reach when they were little.